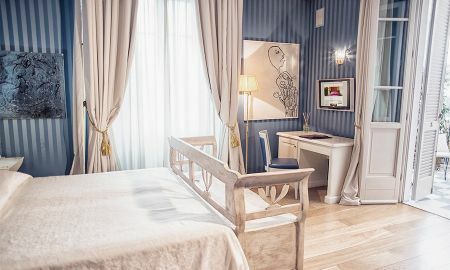 Taking its name from the founder of the town of Pietrasanta, Guiscardo Pietrasanta, Palazzo Guiscardo is a renovated original Liberty style building, dating back to the 1800s, next to a splendid Marina stretching for about 5km with a transparent blue sea whose depth degrades sweetly. 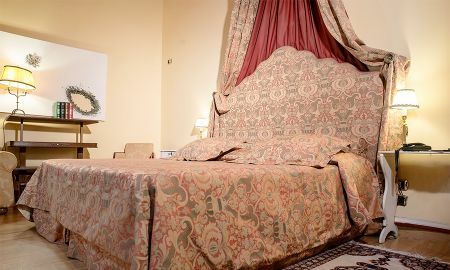 The Palace’s entrance has been furnished in noble palaces style, introducing to the living room, with a “homish” atmosphere, enhanced by comfortable sofas, lampshades and furniture of antique dealings of the end of the 19th century. 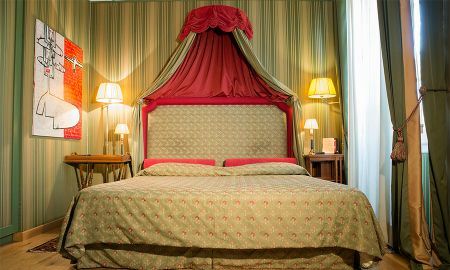 The rooms are all furnished differently in ancient style offering a luxurious and elegant atmosphere with canopy beds, warm colours and prestigious local marble bathrooms, following the tradition of Pietrasanta, town of artists, sculptors and workshops. Every morning, the hotel serves a copious breakfast prepared with jam, marmalade, honey from the "Borgo dei Medici" farm, bread made with different flours, selection of Tuscany ham and cheeses, and a large choice of fruits and yogurts. After a busy day of activities, relax at the hotel’s bar, a cosy spot where you can enjoy your favourite drink with friends. Palazzo Guiscardo is ideally located in Pietrasanta, 3km from a Marina with fine sandy beach.